The fuel economy is the primary concern when looking for a commuter Bike in India. Generally, people like to buy those commuter bikes, which have excellent fuel economy along with the good look and style. By keeping the skyrocketing prices of the fuel in mind, the numerous two-wheeler makers have introduced fuel-efficient motorcycles in the country. Here we are to figure out the best fuel-efficient Bikes that, can you buy without any doubt. We listed 75 kmpl to 104 kmpl Bikes as per the companies claim. Honda Dream Yuga is a mass market motorcycle from the Japanese bike maker’s Indian subsidiary. This city bike from the company goes against models like Hero Splendor Plus, TVS Sport, Bajaj Platina and others in the 110cc, a highly competitive segment in the country. The pricing for the motorcycle starts at INR 44,642 for the base variant with kickstart and spoke wheels, and goes up to INR 48,125, for the top end electric start and alloy wheels variant. The company also offers a mid variant with kickstart and alloy wheels with pricing INR 46,134. Under the fuel tank, it gets power from a 109cc, single-cylinder, air-cooled engine churns out 8.5 BHP and 8.91 Nm via a mated 4-speed manual gearbox. The company claims the motorcycle returns the fuel efficiency of 72 km/l. The Japanese bike maker, Yamaha has offered an affordable bike, called Yamaha Saluto RX 110cc to the Indian market. The commuter bike has been replaced the defunct Crux and YBR in the Yamaha portfolio. The bike has been priced at a smart price tag of Rs 49,221 (Ex-showroom, Delhi). The Saluto RX is featured with Blue Core technology as it offers a decent claimed mileage of 82 kmpl. The motorcycle gets the power from a 110cc 4-stroke, 2-valve, BS IV and single-cylinder powerplant. The 110cc unit churns out a maximum power of 7.3 BHP at 7000 RPM and a peak torque of 8.5 NM at 4500 RPM. In terms of mechanical, the bike houses with telescopic front suspensions and twin rears shock forks. The braking duties are managed by drum brakes at both ends. It also gets an analog instrument panel. The Platina ComforTec is the successor of flagship motorcycle, Bajaj Platina. It is a most affordable motorcycle which comes with a new avatar. Thus, the commuter motorcycle has an excellent mileage and performance, as the PlatinaComforTec directly competes with its rivals in this category. The PlatinaComforTec is featured with a single cylinder, two-valve, DTS-i and 102cc engine displacement which produces linear power output and mileage. The Digital Twin Spark Ignition and Exhaust TEC engine make it able to return 8.2 PS of power at 7500 RPM and 8.6 Nm of torque at 5000 RPM. The company claims that the motorcycle returns a mileage of 104 KMPL. The Saluto becomes the second largest Bikes in this category that offers 78 KMPL claimed mileage. The Yamaha Saluto is an entry-level commuter motorcycle that is specially designed for a middle-class family. 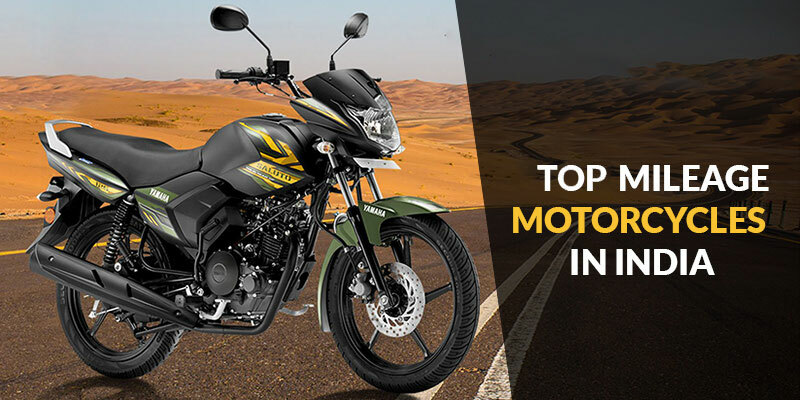 The motorcycle looks very stunning with its head bulb, black visor, impressive fuel tank and black paintwork over the alloy wheels, engine, suspensions, and exhaust pipe. The Saluto is powered by an all-new 125cc, single cylinder and air-cooled engine that return healthy power output and mileage, whereas the Blue Core Technology will help to retain the engine performance and mileage. The Ex. Showroom (Delhi) price of this motorcycle is INR 54,398. After the Hero Splendor, the HF Deluxe is the second choice of the Indian middle-class families. The stylish graphics work below the fuel tank offers the bike a unique appearance. Hero HF Deluxe is equipped with a Hero’s i3S technology with OHC superior mileage engine. The bike is packed with a 4-stroke, single cylinder engine that develops 8.36 BHP power and 8.05 NM torque. The engine is mated to a four-speed gearbox with wet multi-plate clutch. The Hero Splendor iSmart 110 is one of the most fuel-efficient motorcycles in India. The motorcycle is the successor of its earlier Splendor iSmart model that was discontinued by the company. Comparatively, the Splendor iSmart 110 is not only much appealing but also more powerful than the previous model. Other than this, it features stylish graphics and split rail to allure a wider range of audience. Distinct i3S technology has also been carried forward in this upgraded Splendor too, in order to enhance fuel efficiency and to make motorcycle environment-friendly. The i3S stands for Ideal Start Stop System. The mechanism automatically kills the engine when it’s in the idle state in traffic or at the red light and turns it on the back just by a pull of clutch lever when needed. If mechanicals is being considered, the bike is powered by a 109.15 air cooled, 4 stroke single cylinder engine. Mated to a four-speed gearbox, the engine is rated to generate 7Kw at 7500rpm and 9Nm at 5500rpm. As company claims, the motorcycle returns an impressive mileage of 75 kmpl and only available in alloy wheel option. The price of the Hero Splendor iSmart 110 is INR 55,650 (Ex-Showroom, Delhi). Nice Info..! A lot of sport bikes that made in India with good and nice style, but that’s too bad in my Indonesia Country, those bikes from India now only TVS, because Bajaj already closed the assembling plant. If you don’t mind i would like to share this info in my blog.